Christ Church is the oldest Protestant Church in the Middle East. It was completed in Jerusalem in 1849 and soon after became known as the "Jewish Protestant Church." When writing about the establishment of the church, well known historian Stephen Neil called it "one of the strangest episodes of modern church history." Christ Church is indeed unique. It was built for numerous reasons, but the foremost was that the founders of CMJ had a great love and concern for the Jewish people and wanted to share with them the Good News of Messiah Jesus. They also anticipated the Jewish return to the Land of Israel in fulfillment of what was understood to be Bible prophecy (long before the advent of Zionism) and wanted to be in a position to help that process. From the beginning, the message of CMJ has been to remind Christians of the great spiritual debt owed to the Jewish people. The Jewish symbols and Hebrew texts found in the church are reminders that our faith is built upon the foundation of God's promises to the Hebrew patriarchs and prophets and that His covenant purposes for Israel have not been canceled (Rom. 11). 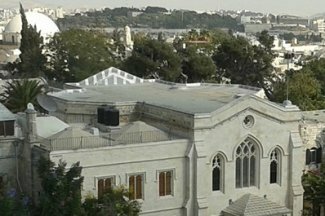 Today Christ Church is an evangelical Anglican congregation that worships in our historic church in the Old City of Jerusalem. The congregation, comprised of expatriates who have come to serve in Israel or the West Bank along with local believers (both Jews and Arabs), welcomes visitors and tourists to its worship services. We are an English speaking congregation that appreciates our Jewish roots in a liturgical and historical context. Towards this end we celebrate both Jewish and Christian holidays, incorporate some Hebrew into our liturgy and preach in a way to emphasize a Hebraic understanding of the Gospels. At the same time we remain unashamed of our Christian heritage and recognize that the spiritual treasures handed down to us by previous generations of Christians are part of our lives and worship. We share our facilities with a Messianic Hebrew congregation (that meets on Saturday) and partner with them in various ways. We are also part of the Anglican Diocese of Jerusalem and cooperate in charity projects with a number of Christian churches and fellowships inside the Old City. Our commitment to reconciliation is expressed in the make up of our staff: Messianic Jews, Arab Christians and expatriates who live, work and worship together in community. Christ Church has endorsed GAFCON's Jerusalem Declaration and is in close fellowship with the Church of Uganda and the Anglican Church of North America. In addition, we have close links with many churches in the US, the UK and South Africa.